Fail Proof Headlines – How To Write Headlines That Capture Attention Fast is critical if you are going to grab your online niche target audience to make money. Online information seems to be what makes the internet go round. This means you have the advantage if you know how to tactfully write top quality headlines that land you in front of your audience. This ebook teaches you how to do this in a proven systemic fashion. Afterward you will just need to rinse and repeat to create your success. These tips and tricks are going to give you the power and know-how to dazzle and drive quality visitors to your website. When you learn the basics of writing captivating headlines and ultimately creating powerful sales pages on top, you possess the marketing expertise you need to drive up your rank, increase conversions and ultimately make more money. 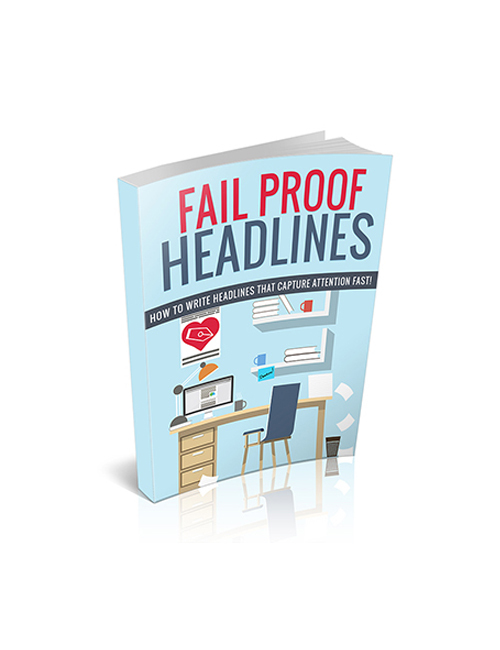 Fail Proof Headlines – How To Write Headlines That Capture Attention Fast makes it easy for you to gain the trust of your top niche audience and make money in the process.